An automotive robot typically can work 22 hours or two 11- hour shifts with a short break between each a day. No lunch break, No water-cooler chats with other, No weekends or vacations. Introduce the new robot that created by FANUC. FANUC and Cisco’s Zero Downtime (ZDT) solution recently emerged from a successful pilot phase with General Motors and others. In a factory that’s kicking out one vehicle per minute, every minute of stalled production is hemorrhaging profits, labor expenses and more. Unplanned downtime can cost as much as $20,000 potential profit loss per minute, and $2 million for a single incident. Using a Cisco network, the solution connects robots on the factory floor with the enterprise (business office, often referred to as the carpeted space). It also connects the robots into a Cisco fog or edge compute device that analyzes big data on the plant floor before transmitting it securely to the Cisco cloud for further analysis. Traditionally, networking of automotive robots has been limited to the manufacturing cell in which the robot operates. These networks perform a variety of functions, such as controlling the sequencing of production tasks and allowing robots to collaborate with each other. But, crucially, these networks do not extend to the enterprise or to the cloud beyond it. As a result, a robot problem was only discovered after the fact—and often too late to avoid downtime. Zero Downtime can tell how many robots that need a maintenance in a week. The production plant manager gets the report and can schedule maintenance at a convenient time, thereby reducing the overall maintenance cost. With ZDT, maintenance reminders are based on real-time usage of the machine. They assess everything from conditions in a robot’s environment to its usage program path, travel distance, motor torque profile and more. Any data relevant to the maintenance issue is sent to the Cisco cloud, where a cloud analytics engine captures “out of range” exceptions and predicts the maintenance needed. The potential addressable market is sizeable. According to a report from McKinsey, industrial robots are among the 12 emerging technologies most likely to disrupt the status quo in the near future. The potential economic impact of industrial robots could reach $600 billion to $1.2 trillion per year by 2025, the report states. 92 percent of more than 60 million machines in factories throughout the world are not yet network-connected. Legacy robots could benefit greatly from solutions like ZDT that securely connect them by embedding switching, security and compute technologies directly into the machines. 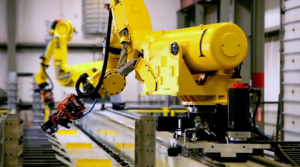 A solution from FANUC and Cisco is taking predictive maintenance to the next level. If you’re an automotive robot—one of those massive, steel arms that assemble cars with preternatural efficiency—you keep a grueling work schedule. Your typical workday is 22 hours, or two 11-hour shifts with a short break between each. And you often work seven days a week. No lunch breaks. No water-cooler chats about “Game of Thrones.” No weekends or vacations. And guess what? If your maker is FANUC, you’re about to get even less downtime. The company is working with Cisco to eliminate downtime for industrial robots and manufacturing equipment. FANUC and Cisco’s Zero Downtime (ZDT) solution recently emerged from a successful pilot phase with General Motors and others. ZDT is now being used in production with over 6,000 robots at automotive plants globally. Unplanned downtime is a worst-case scenario for automotive manufacturers. In a factory that’s kicking out one vehicle per minute, every minute of stalled production is hemorrhaging profits, labor expenses and more. Unplanned downtime can cost as much as $20,000 potential profit loss per minute, and $2 million for a single incident. Many factories have buffers to allow production to continue downstream from an equipment failure. “But if you’re downstream from a buffer, you’re out of luck,” Tsai says. ZDT helps automotive manufacturers avoid downtime through predictive maintenance—an increasingly common Internet of Things (IoT) approach. Using a Cisco network, the solution connects robots on the factory floor with the enterprise (business office, often referred to as the carpeted space). It also connects the robots into a Cisco fog or edge compute device that analyzes big data on the plant floor before transmitting it securely to the Cisco cloud for further analysis. A step up from this reactive “break-fix” mode of dealing with problems is scheduled maintenance—like getting a reminder to change your car oil every 3,500 miles. But scheduled maintenance is a one-size-fits-all approach that doesn’t take into account how a robot is actually used. What happens when a robot’s environment is unusually cold, hot, or dusty? "Zero Downtime might tell you that three of your robots need maintenance this week. The production plant manager gets the report and can schedule maintenance at a convenient time, thereby reducing the overall maintenance cost. "With ZDT, maintenance reminders are based on real-time usage of the machine. They assess everything from conditions in a robot’s environment to its usage program path, travel distance, motor torque profile and more. Any data relevant to the maintenance issue is sent to the Cisco cloud, where a cloud analytics engine captures “out of range” exceptions and predicts the maintenance needed. Although ZDT is best known for this proactive failure prediction, the solution does much more. Its ability to remotely monitor a robot’s health allows for optimization—for example, reducing energy consumption, improving production throughput, and extending the robot’s mechanical life. Going further, ZDT can give insight not just into one machine, but into the full factory and how it works together. For example, by connecting with the enterprise, the solution could have access to things like sales information—allowing a plant manager to reschedule maintenance in order not to clash with a big order, among other benefits. “This is the next level of predictive maintenance,” says Douglas Bellin, Cisco’s senior manager of Global Private Sector Industries. Going further still, ZDT allows FANUC to fine-tune the algorithms it has written on the collected data in real time. Instead of tracking just the robots in one location, FANUC can now aggregate all of the data across all locations within the customer’s enterprise and use it for deeper analysis. “The difference here is that this is done across multiple locations and in the cloud, securely, to allow scale in both data captured and who this can be offered to,” says Bellin, adding that Cisco, GM and other machine builders are looking to expand the ZDT concept to other products as well. “This could be pervasive across many industries and machine types,” Bellin says.